Just east of the intersection of High St. and Boylston, next to Hose House #1. Torn down before 1908 for the construction of the present day firehouse. Orignally numbered 66 before renumbering of Washington St.
1) Note the "Employment Office" sign by the entrance to the stairs next door at #68. This was likely the office of Mrs. Benjamin Hill. Brokers like this were often the source of servants for the wealthy households of Brookline. 2) Note the "Board Rooms" sign on the second floor. 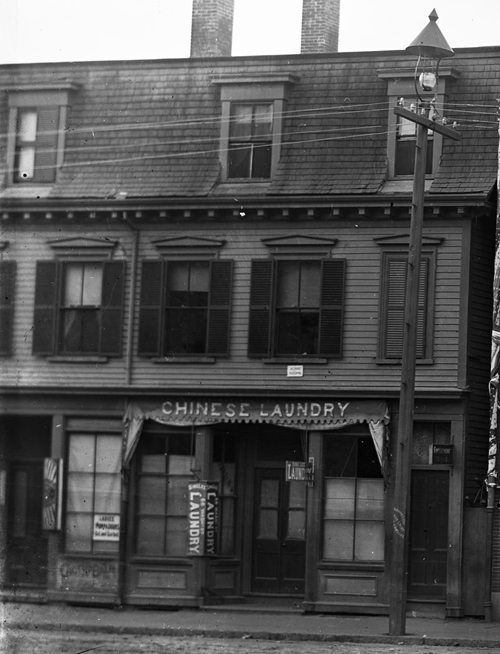 Listed in the city directory as boarders at that address are Thomas Steward, hairdresser and Joseph Hartnett, carriage painter, who worked at Michael Quinlan’s carriage factory one block away at the southwest corner of High St. and Boylston St.
3) Note the "Ladies Pompadours Cut and Curled" sign to the left at the hair salon next door.